At least 40,000 people who fled fighting in South Sudan are staying in horrific conditions at a UN camp, Medecins Sans Frontieres (MSF) says. Many were living in knee-deep, sewage-contaminated floodwater with some sleeping standing up with children in their arms, the medical charity said. MSF urged the UN to move the worst-affected to drier land in Bentiu. Fighting between government and rebel troops has displaced at least 1.5 million people since December. The UN is yet to respond to MSF's criticism. Bentiu has changed hands several times since the crisis began and thousands of people have sought refuge in the UN camp in the town, situated in oil-rich Unity State. 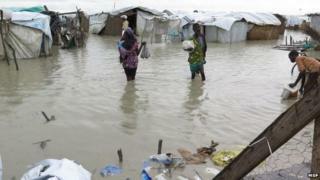 With the onset of rains, MSF says the already harsh and overcrowded conditions in the camp have now become deplorable. "With few possibilities for drainage, current living conditions in the camp are horrifying and an affront to human dignity," MSF's emergency co-ordinator Ivan Gayton said in a statement. What began as a political dispute between President Salva Kiir and his former deputy, Riek Machar, has escalated into ethnic violence. Regional mediators have set a 10 August deadline for both sides to agree on a transitional government and implement a ceasefire. The BBC's Ethiopia correspondent Emmanuel Igunza says a new round of talks in Addis Ababa this week initially stalled, but restarted on Friday afternoon. Image caption Fighting erupted in the South Sudan capital, Juba, in December 2013. It followed a political power struggle between President Salva Kiir and his ex-deputy Riek Machar. The squabble has taken on an ethnic dimension as politicians' political bases are often ethnic.